I looked around the 5’x4′ cubicle walls, and heard a distant drip, drip as I smelled the dank musty air. The chair I sat on felt hard as stone. I hadn’t heard from another employee in the past 3 days with the exception of a faint tapping on my wall from prisoner– I mean, employee id number 4582749, who shared a cubicle wall with me. Wait. I closed my eyes, and there it was again. A man sat in silence with chains on his hands and feet clothed in a brown robe. He sat cross legged on a hard prison floor, but as he closed his eyes his breathing became slow and rhythmic. Then, the chains fell off. Here was a man in the same chains as me, but for him the chains weren’t constraints at all. In this article, I’m not going to go in-depth on the science behind meditation, the reasons you should meditate, and all the other great research that’s covered adequately in 50 other well-known self improvement books. Instead, I’m going to bring you into a meditation session with me while dramatizing the distractions I face. I’ll show you how I deal with them. I believe this is a more engaging way to write about nonfiction topics, and I view it as a creative challenge to convey useful information in a fun way. With that explained, let me bring you back in time to bring you forward again. I felt my heart racing. A pressure built in my chest. I couldn’t breathe except for shallow gasping breathes. My entire skin felt raw against my clothes. The combined sensation crescendoed into a feeling of claustrophobia. Yeah, overall not a real fun sensation. Strangely, I wasn’t scared. For me panic attacks didn’t come with a sense of fear or any strong emotional reaction. I would observe my physical reaction with a detached analytical part of my brain, but none of that helped the sharply unpleasant feelings. After I had a few of these panic attacks, I started reading to discover a solution. One of the powerful techniques that I discovered is The Resting Breath. This simple exercise practiced 1-2 times a day for 15 minutes a session trained me to bring myself from a high stress state, to a state of relaxation. With that foundation laid, let’s fast forward back into my office and pick-up where I left off. There’s a certain peace that comes from imagining myself in a serene, remote area. I sat comfortably as I pictured a meadow on a distant mountain. Soft green grass stretched around me and I sat overlooking a pond of still water in a beautiful, calm dreamscape. The water rested in front of me, and a monk sat peacefully at the water’s edge. Commentary: The monk is my depiction of the ideal experience. Ok, I’ll stop with the subtext now. I felt anxious not doing anything, and I felt the chains of my job still hanging from my arms and legs. The burdens I carried and dreams I couldn’t reach weren’t easily pretended away. However, the monk had peace. Why couldn’t I? “What do I do?” My words seemed to rustle the silent scene around us. Without a word, he gestured for me to sit next to him. I sat to his right. The soft grass sunk down and held me like a pillow. The water shimmered still as glass. The wind held its breath as I looked over the pond. As I sat, I kept pulling my mind back but it jumped from one thing to the next like a bumble bee in a brush fire. There was that case study on concrete density that was due to my boss at 2pm. I needed to pick-up eggs on the way home from work. I remembered that I hadn’t returned my mom’s phone call, and on and on. Glancing to my left at the monk beside me I tried to figure out what he was doing to focus his thoughts. I watched his deep breathes come: in and out, in and out. Commentary: That’s right, I have multiple voices sharing my headspace. Prof represents the analytical learner that’s always trying to pen the essence of my life lessons. Let’s not get too side tracked here. I glanced at the monk then back at Prof to whisper, “Ok. I think I got it.” Every word and careless thought disturbed the mood of the serene landscape. I sucked my breath in. Oops, breathe quietly, right. I tried again and quietly breathed in. Wow, even when I try to be quiet I breathe loudly. I never thought I’d be the mouth breather annoying myself. Breath in: 1, 2, 3, 4. Holding my breath: 7, 6, 5, 4, 3, 2,1. Breathe out slowly. 8, 7, 6, 5, 4, 3, 2, 1. I repeated this pattern twice. “What’s for lunch?” Prof was obviously distracted at this point. Not one for meditation I guess. “Shhh.” I whispered a little annoyed at the new persistent thought. “Later, please.” I glanced over at the monk and he seemed undisturbed. “Why do you count up, then down?” Prof seemed to be snacking on something while he poked at a large buzzing insect. I groaned internally. Buzzing insect! Why would my mind decide to bring a buzzing insect into my meditation world? With frustration I tried to center myself. “Your thoughts are clouds floating off you into the sky.” The monk’s soothing voice almost made up for the complete nonsense he had spoken as his only words of the day. Prof looked thoughtfully at me then put an explanation to the cryptic monk-speak. “I think he’s saying, observe your thoughts. When a distracted thought comes through your mind, pretend it’s a cloud and watch it float away. Don’t fight it. Acknowledge the thought. Accept it. Then let it float away like a cloud.” Prof finished his translation of the cryptic speech while swinging a hand at the now much larger buzzing insect. I closed my eyes and tried again. 1, 2, 3, 4. Holding: 7, 6, 5, 4, 3, 2, 1… 4 count breathing in. 7 count hold. 8 count breathing out. “Sorry. Quick reminder, your wife said to…” Prof’s voice trailed off. I watched as the thought floated off him like a cloud. Soon the giant insect began to join the distant thought floating away, leaving in its place the stillness of the pond in front of me. 1, 2, 3, 4. Holding my breath: 7, 6, 5, 4, 3, 2, 1. Breathing out: 8, 7, 6, 5, 4, 3, 2, 1. I repeated the pattern for 10 breathes, and relaxation gradually replaced the feeling of agitation. The monk kept breathing, and seemed to be concentrating. I continued like this for 5 minutes. Watching my breath, and letting all the tension and stress release into the air. Another reminder about my grocery list came, and I observed it, accepted it, and watched it float away. With each breath, the stress of the day left my body. By the end, I felt at peace. “Yeah, no recap needed. I literally was here doing this for the past 10 minutes.” I opened my eyes and the dreamscape faded from view. Resource for learning to breathe: Breathing: The Master Key to Self-Healing. The simple practice of breathing in a 4/7/8 pattern, also called “The Resting Breath”. This practice has been a huge help to me in dealing with anxiety, panic attacks, and generalized stress. 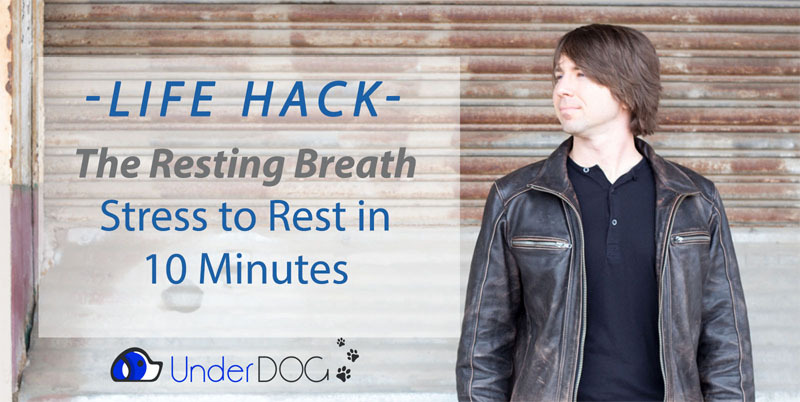 During practice sessions it helps to precede the 4/7/8 Resting Breath with 1 minute of quick short breathes breathing at a rate of 2-3 breathes per second. This short, quick breathing, puts you into a state of focus and brings you to a higher level of stress. Then the Resting Breath will bring you from that stressed state into a rested state. When you practice these two types of breathing in tandem, your body will naturally learn how to come down from a stressed state to a relaxed state. Try practicing this technique 2 times a day for a total of 10 minutes each session. This exercise of following the breathe and letting distractions drift away has been a useful tool for me to fight off stress on-demand. Once you’ve practiced the exercise in non-stressful situations for 1-3 months then you should be able bring yourself from a stressed condition to a relaxed condition wherever you encounter stress. I hope this simple practice of breathing will help you as much as it has helped me. Do you have any useful life hacks? Let me know in the comments below! Want to read more? Join my email list to receive notifications when I publish next week’s article.